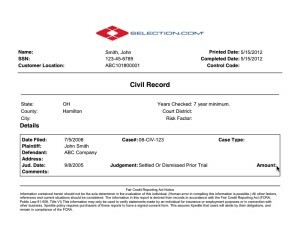 Civil Records Check reports will reveal the record of civil cases where the applicant was either a plaintiff or defendant. They will show the nature of the complaint, status of the case, date of filing, names of plaintiffs / defendants and whether a judgment was entered. This report is designed to be utilized only where the existence of such civil records would be a critical factor in an applicant’s suitability for employment. Employers should use these records only when relevant to a specific job function and when backed by appropriate policies and procedures. Civil reports are researched and completed through personal contact by the Selection.com staff. The following information is required for a civil records search: name, Social Security Number, date of birth, and the county and state of the requested search. Reports include a combination of name, case number, case type, file date, verified by, plaintiff name, defendant name, defendant address, judgment date, amount and any comments. Turnaround times average 1-4 days. Click here for a sample civil records check. Click here for a full description of the civil records check report.